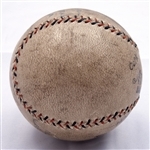 Japan had begun playing baseball well before the turn of the 19th century when it was introduced by sailors and missionaries. 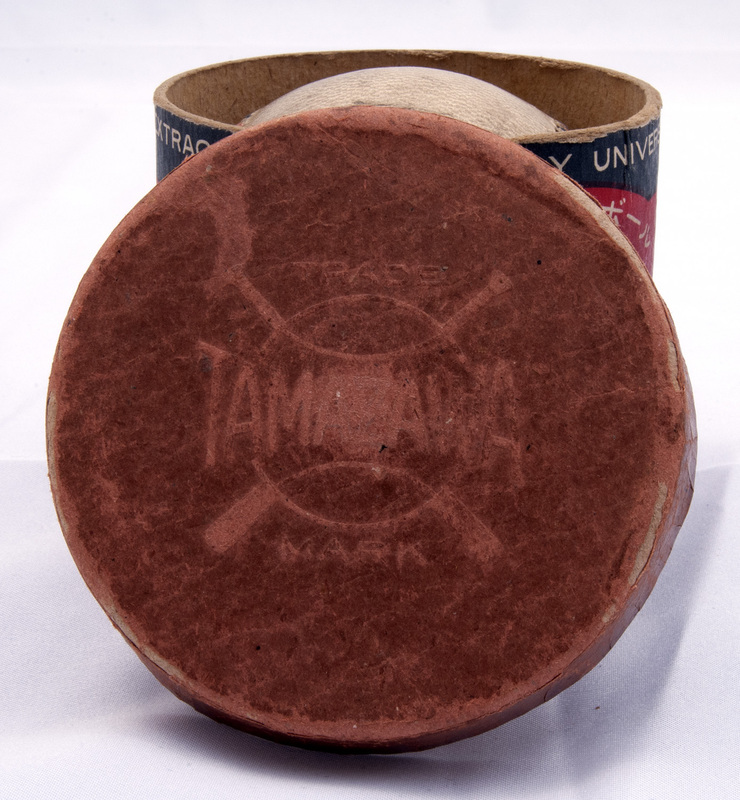 By the 1920’s the nation’s best colleges were playing the sport, but there was no professional league beyond the university level. 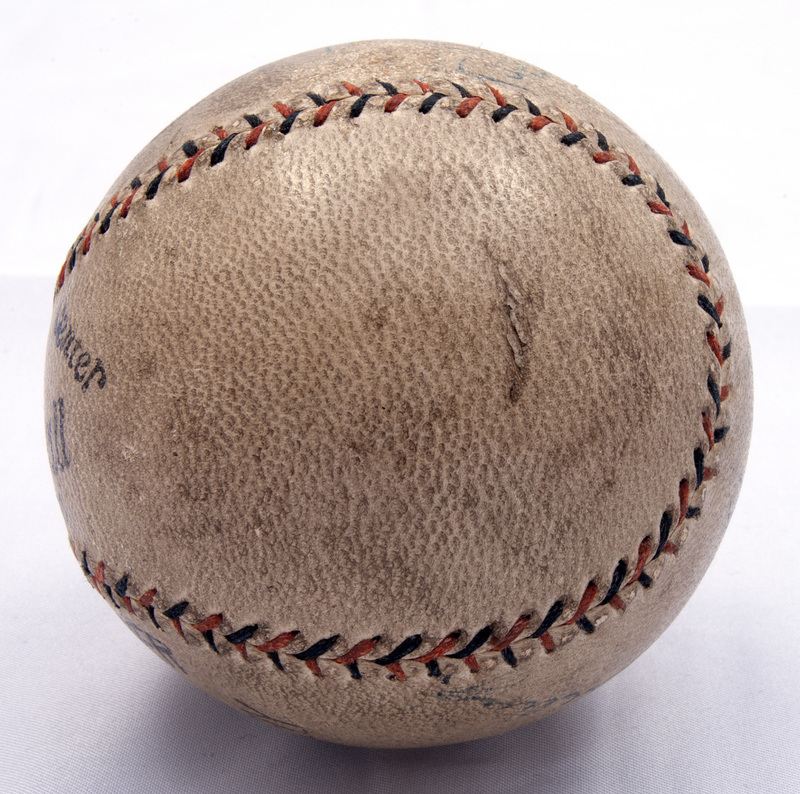 That changed with the arrival of Babe Ruth and his team of American League All-Stars in November, 1934. 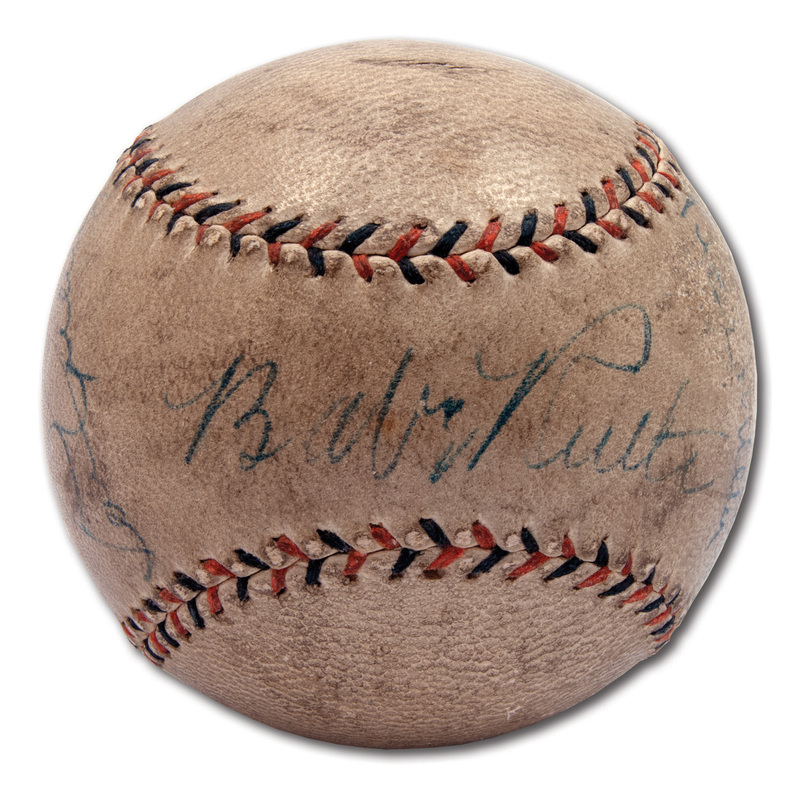 Ruth, Gehrig, Foxx and the gang barnstormed through 12 cities and met with wild appreciation at every stop. 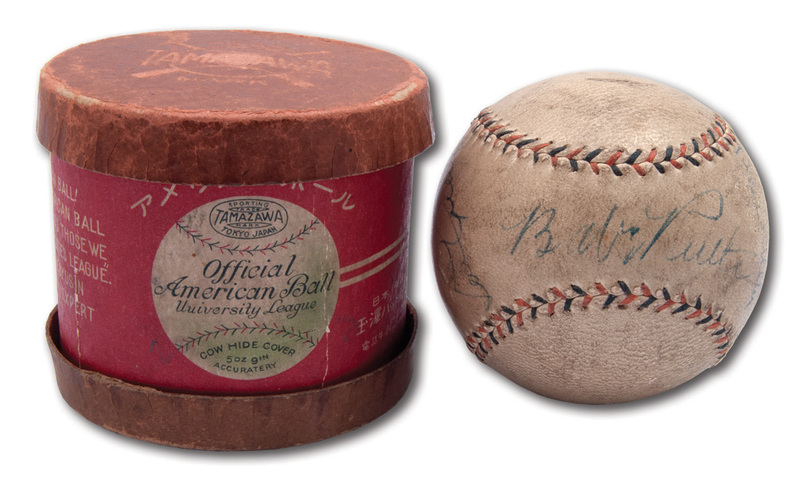 In the 18 games, Ruth would hit 13 home runs, making him a star in Japan as much as he was in America. 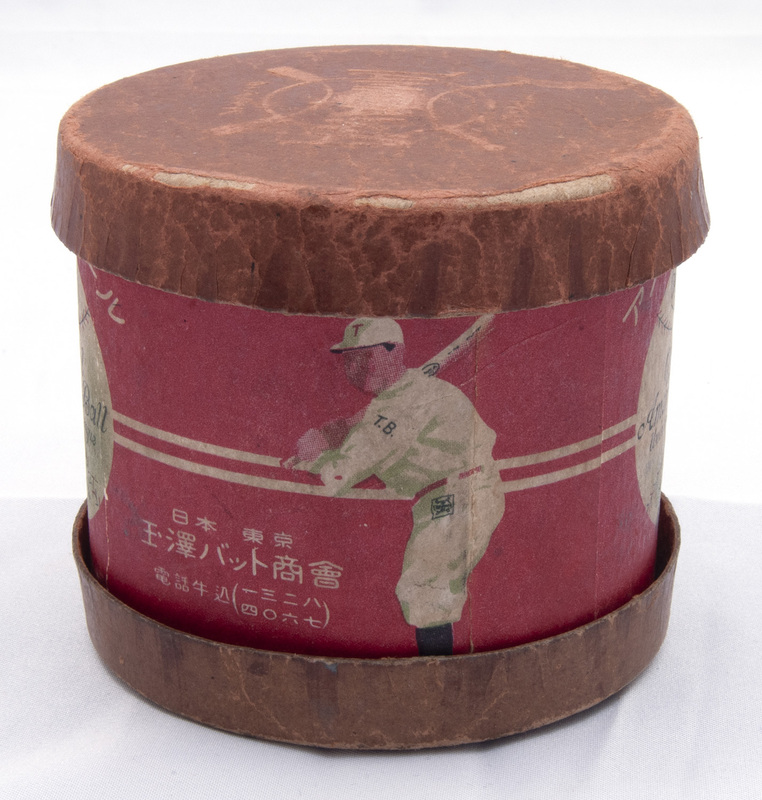 Backup catcher Moe Berg used his downtime to illicitly film the Tokyo skyline and seaports, which were later put to use in World War II to identify bombing targets. 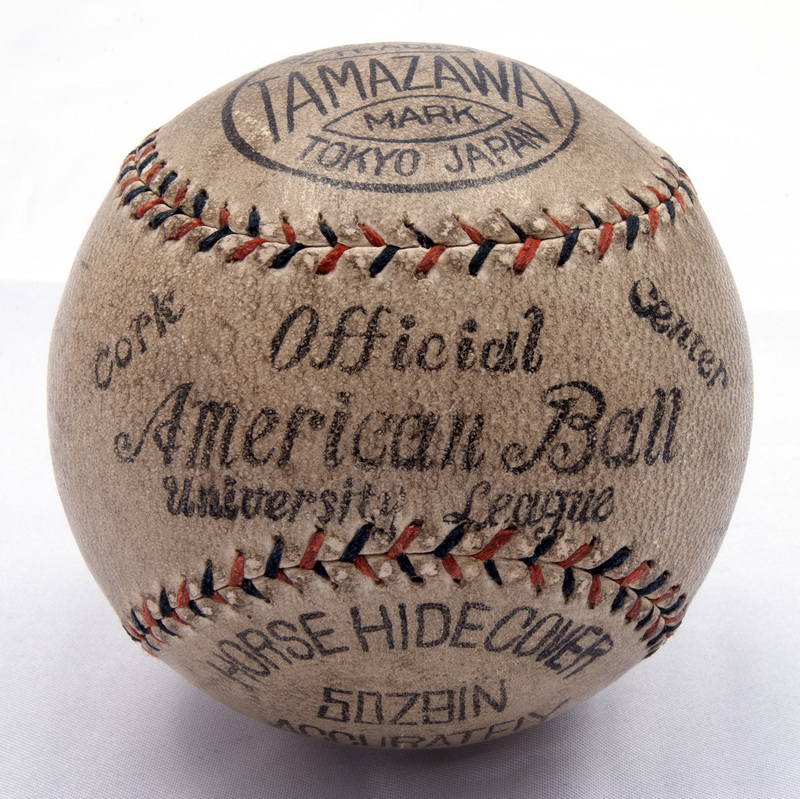 To face the Americans, Japan assembled a national team of the best high school and college athletes, including Eiji Sawamura, the 17 year-old who famously struck out Babe Ruth, Jimmie Foxx, Lou Gehrig, and Charlie Gehringer in one game. 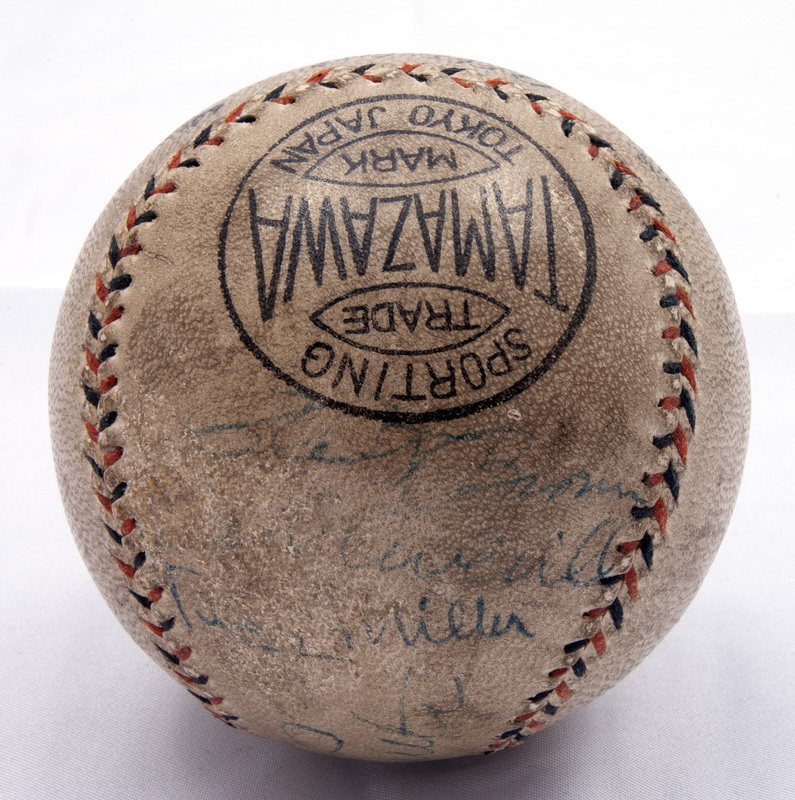 Though the native players were clearly outclassed by the likes of Gehrig, Earl Averill, Lefty Gomez and Ruth, the tour clearly showed Japanese fans' desire for a professional baseball league, and Japan’s national team would go on to form the nucleus of the Tokyo Giants. 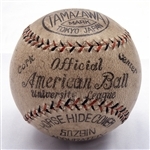 This Japanese-made Tamazawa “Official American Ball” has been signed by five of the Americans: Hall of Famers Babe Ruth (6/10) on the sweet spot, Lou Gehrig (7/10) on the adjacent west panel, Earl Averill and All-Stars Bing Miller and Clint Brown. 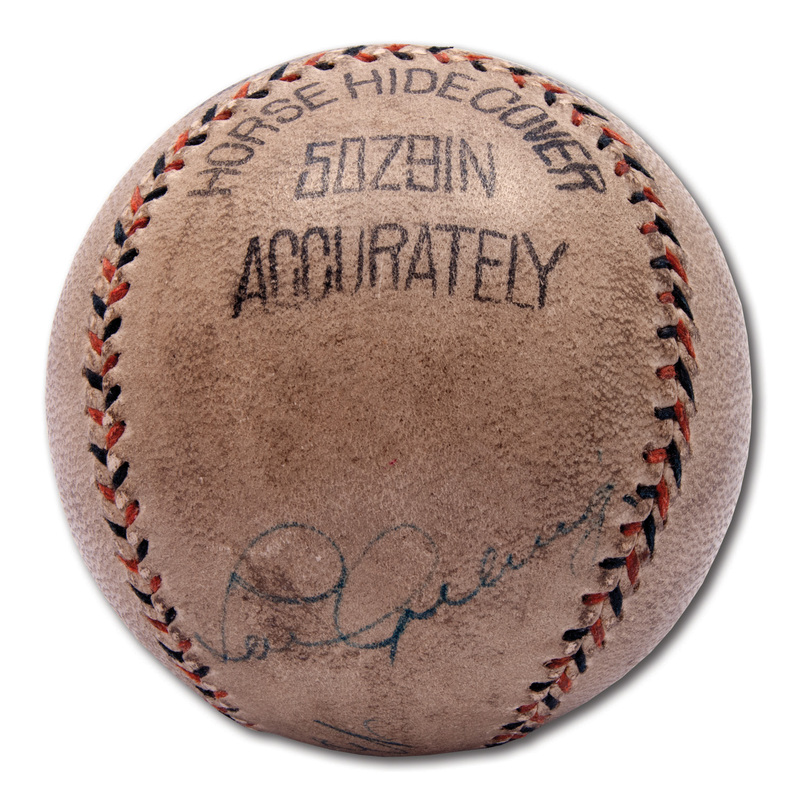 The black and red stitched ball exhibits a moderate and even amount of toning and soiling on the surgface, but the blue ink signatures (averaging 5.5/10) remain clear and legible. 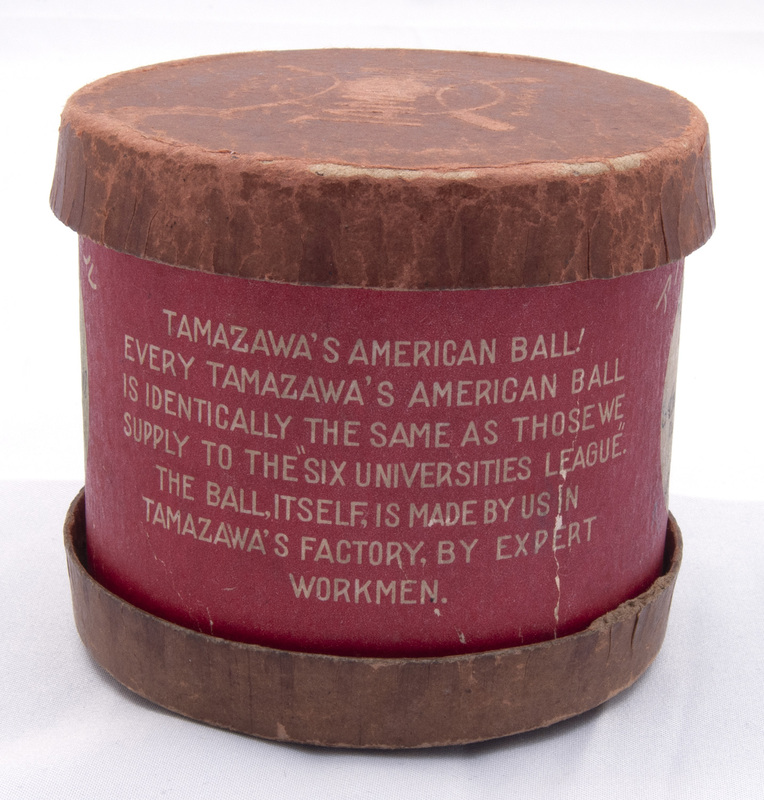 The ball comes complete with its super rare original Tamazawa box, which is in exceptional condition compared to the few examples that have survived. Just some minor edge wear and natural toning show the box's age. 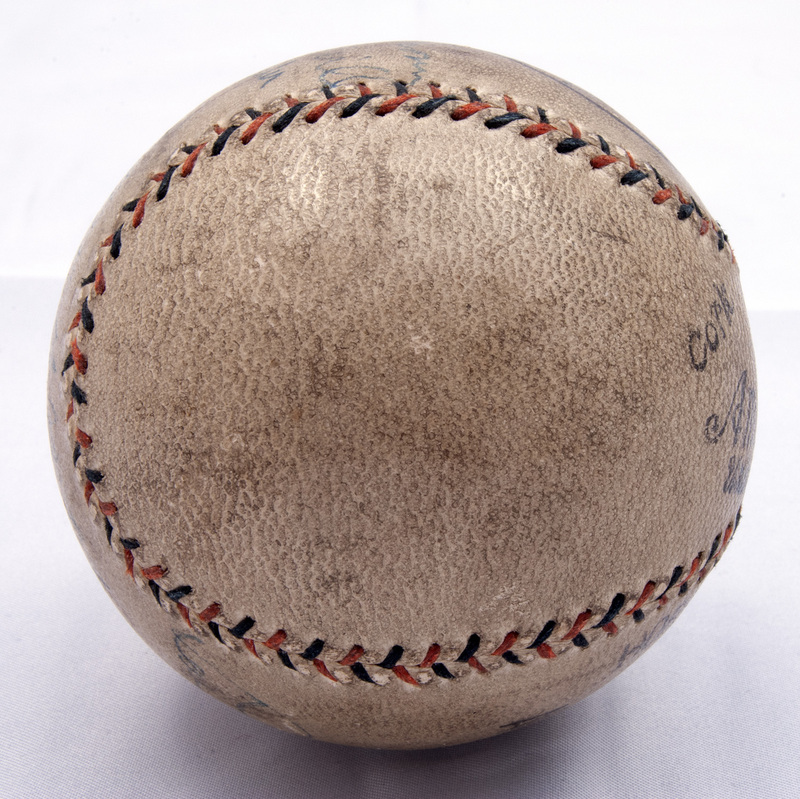 This superb piece of world history is fresh to the market from the family collection of a consigner who still lives in Japan. 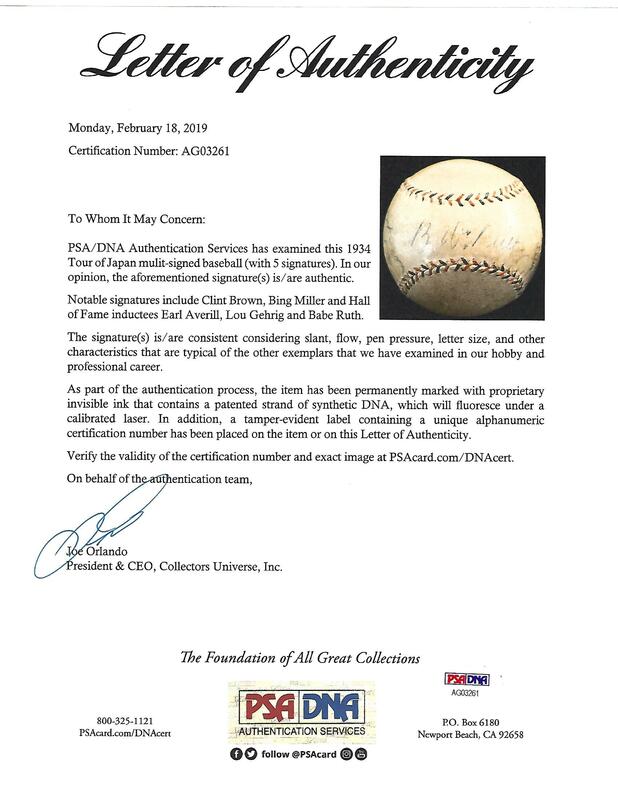 Includes full LOA from PSA/DNA.